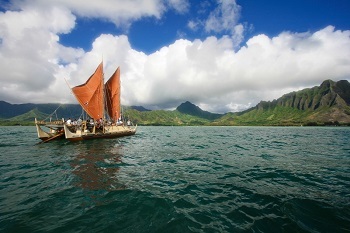 May 29, 2014, Orange County, CA – Eternally inspired by the strong tradition of giving an offering or tribute in Polynesian culture, OluKai is honored to announce the brand’s partnership with the Malama Honua Worldwide Voyage of prestigious sailing canoes, the Hôkûleʻa and Hikiananlia, built with the same ingenuity that brought the first Polynesians to the archipelago of Hawaii. OluKai will contribute time and product to the 3+ year Worldwide Voyage; the brand will supply SS15 products to all the proficient watermen and women who will crew the voyage to wear test and share their feedback on the performance of each shoe. The Hôkûleʻa represents a large part of OluKai’s company mission – honoring and preserving Hawaiian culture and traditions. Officially departing Hawaii the week of May 26th, weather permitting, the Worldwide Voyage will highlight diverse cultural and natural treasures and the importance of working together to protect them. Covering 47,000 nautical miles, 85 ports and 26 countries, the Malama Honua Worldwide Voyage will sail across the Earth’s oceans to join and grow the global movement toward a more sustainable world. Crew members on both the Hôkûleʻa and Hikiananlia will sail using the 3,000 year old traditional method of Polynesian deep sea navigation, with no modern instruments. OluKai Konohiki and legendary waterman, Archie Kalepa, will join the Hôkûleʻa for several legs of the journey from July to August. The Hawaiian name for this voyage, Malama Honua, means “to take care of our Earth.” The Worldwide Voyage means to show the world how we can engage all of Island Earth – by practicing how to live sustainably, while sharing, learning, creating global relationships, and discovering the wonders of this precious place we all call home. OluKai is an ultra-luxury lifestyle brand that believes everyone, no matter where they are, can live Aloha. OluKai is one way to unlock its spirit in all of us. It is an inspired brand that whole heartedly believes in creating an emotional connection with the consumer and communicates from an “inside-out perspective.” The company is committed to building a unique and better class of products that blend ocean heritage with modern performance while leaving the smallest footprint possible on the planet. Through its Fit by Nature™, Crafted by Hand™ design principle, OluKai builds every pair of footwear with signature anatomically contoured footbeds to deliver the perfect balance of instant comfort and lasting support. Each pair features beautiful, quality materials and handcrafted details inspired by island culture. In every facet of its business, the brand is committed to respecting the people and the environments it touches. Inspired by the strong tradition of giving an offering or tribute in Polynesian culture, OluKai established the ‘Ohana Giveback Program to support the efforts of those who continue to give back to preserve local cultures and traditions. For more information visit www.olukai.com.